The Chevy Silverado 2014 is considered to be at the top of its class according to a rating by Consumer Reports. Consumer Reports known for its consumer based testing and one of the largest independent automobile testing centers gave 81 points to Silverado beating the Chrysler Ram by a mere three points in the full size truck category. The objective test results allowed Silverado to take a narrow lead over Ram. The redesign of the 2014 Silverado gave Silverado the boost to surpass Ram in the total score. The trucks were rated in various categories but the categories that gave Silverado the lead were payload, fuel economy, towing capacity and a larger truck bed. 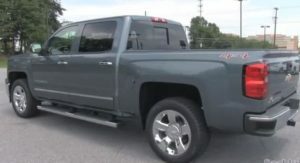 The Chevy Silverado redesign includes a larger truck bed, an easy to manage tail gate and a lower step in height with stairs to make accessing the trucks load easier. These changes in design helped to give Silverado the number one spot. Silverado also beat Ram in fuel economy getting 16 mpg. An 11,000 pound towing capacity was also a victory for Silverado. The objective tests helped Chevy Silverado to inch over the finish line ahead of Chrysler Ram. In the subjective tests Silverado preformed well and so did Ram. The Silverado provides a truck comparable to a luxury car, with a quiet cabin and comfortable ride. It rated excellent in road testing. However, Consumer Report suggested that if you spend a lot of time doing day to day driving the Ram might be a better choice due to a friendlier control layout, more comfortable seats and a better rear seat. The Silverado came in first because it is everything a true truck should be and more. It has the capacity to work hard and the appeal of a luxury vehicle. It can do a hard days work and it allows you to work with it in comfort. When it is off duty and used for transportation it provides a smooth comfortable ride with easy handling. If you prefer more comfort than truck consider the Chrysler Ram but if you want a true truck Chevy Silverado is the one to pick.